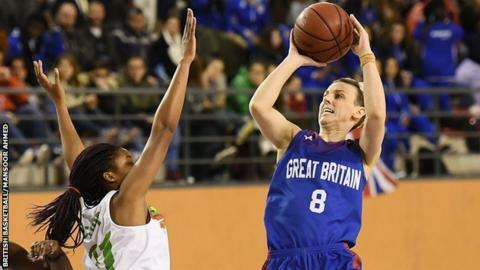 Great Britain's women scored 15 unanswered points to move top of their Eurobasket 2019 qualifying group with a 64-56 win over Portugal in Loule. Chantelle Handy led GB's scorers and overall effort with 21 points and Temi Faghbenle added 15 and 10 rebounds. GB made a slow start and trailed for most of the game but from 56-49 behind their late run stole victory. Britain travel to Tel Aviv to play Israel in their fourth qualifier on Wednesday. Without leading scorer Jo Leedham-Warner, who is resting a foot injury, GB fell 17-6 behind during the opening quarter, only hitting their first field goal - a three from Georgia Jones - after nine fruitless minutes. They then levelled in the second quarter with Handy's second three-pointer and her third, with three and a half minutes remaining in the half, gave GB their first lead, 27-24. In the third, Portugal regained the lead as forward-centres Fagbenle and Azania Stewart were both given their fourth fouls and benched by coach Chem Buceta. Handy, who hit four three-pointers, took over the forward duties but GB trailed by seven points for much of the last quarter before a three by Rachael Vanderwal and two baskets from Fagbenle sparked their victory surge. Handy, who hit the late three-pointer that saved the team against Israel last November, said Portugal had been tough to beat. "They're an aggressive team to play against and we didn't get anything easily," she told BBC Sport. "We weren't getting stuff we wanted to get in the first three quarters. In the fourth quarter we stepped it up when we needed to." In the other game in Group D, Israel edged out top seeds Greece 65-63 in Tel Aviv, giving another twist in the battle for top spot and the only certain qualifying position.